We are taking you back over 153 years to April 14, 1865. It is Good Friday. People are so glad to have the war over! It will be this evening that Abraham and Mary Lincoln will be attending the Ford Theatre in Washington, D.C. You know the rest of that story. Mr. Lincoln has been reincarnated as Gerald Payn, former dairy farm owner / operator and later science teacher and current member of several historical operations. He is coming to us from Wooster. Gerry’s portrayal of Abe Lincoln has received rave reviews from those who have seen it. All are welcome! No charge for attendance! Outside of a dog, a book is a person’s best friend. A couple dozen locals wrote essays on some area of our history. These short, very readable essays relate many of the stories of South Euclid past and present. Stories of South Euclid’s First Century. Seven groups of Notre Dame College students wrote an historical fiction piece taking place locally in some decade from 1880-1975. Easy reading for tweens on up. Both books are available at Notre Dame College Library, South Euclid Community Center, South Euclid True Value Hardware, and Warehouse Beverage. Or from https://www.lulu.com/ or us: http://se-lhistory.org/html/merchandise.html. You deserve a brick today! 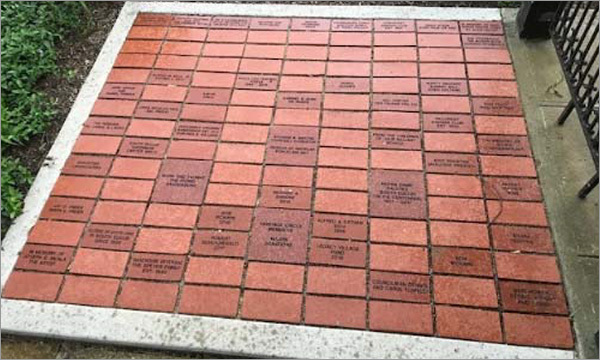 Please consider getting a signature brick for you or your company to be set in the Gatehouse patio of the Telling Mansion. Find out more at: http://se-lhistory.org/brick.pdf.